This picture was taken around 1950 with some of my grandmother’s siblings. 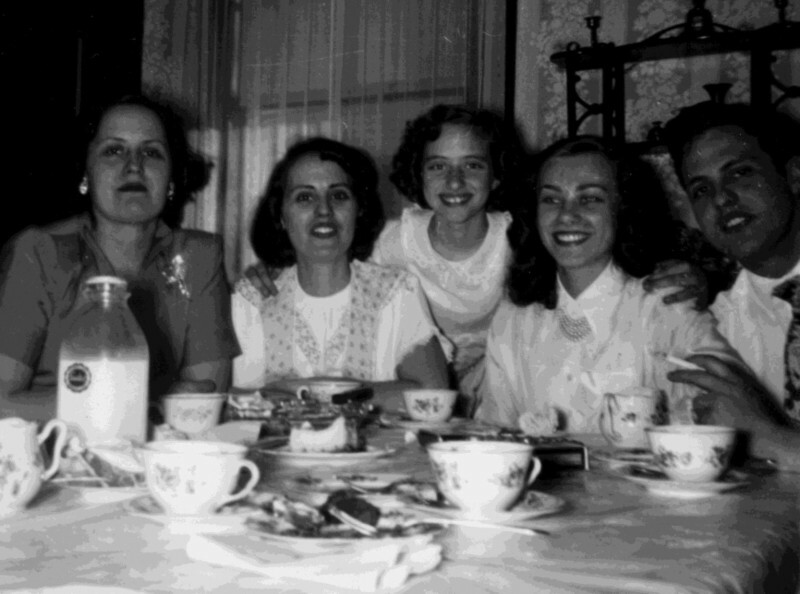 From left to right: sister Jean [Barbaresi] Borrelli, sister Edith [Barbaresi] Piccolo, niece Terese Bontempo, sister-in-law Regina [Lipowski] Barbaresi, and brother Gerry Barbaresi. Notice the milk bottle and what appears to be an untouched piece of pie in the center of the table. What’s up with that? While I was growing up, Edith lived with my grandmother, Dora [Barbaresi] Donroe, for some number of years. In her sixties at the time, Edith always struck me as a tornado of fury. It seemed best just to stay out of her way. 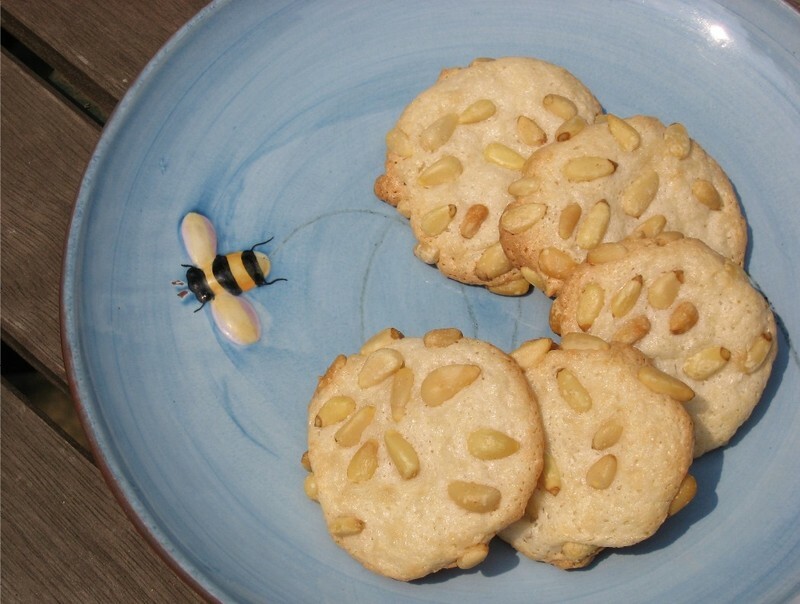 But, I remember coming out of the woodwork for these pignoli (pine nut) cookies. They were totally worth it. Edith shaped these into crescents, not an easy task with such a sticky dough. I never have any luck with this, and today was no different. I gave up halfway through and just dropped them in circles with the rationale that, who the hell cares? When I pulled them out of the oven, I saw that all of the crescents had transformed themselves into circles anyway, so it was like I didn’t even try. I’m not sure, but I think I heard her laughing. This moist and chewy Italian cookie is one of my all-time favorites. Preheat oven to 350°F. Line two cookie sheets with aluminum foil or parchment paper. Crumble the almond paste into tiny pieces. You can do this painstakingly by hand, or you can whiz it in the food processor in a flash. Your choice. With an electric mixer, beat the crumbled almond paste, sugar, and egg whites together until mixture fluffs up, about 2 minutes. Spoon ½ teaspoon dough, dip spoon upside down into pine nuts, and push dough onto baking sheet, nut side up. I find a regular teaspoon (as opposed to a measuring teaspoon) is easier to work with. Bake until just golden, 12 to 15 minutes. Pull the foil off the pans to allow these cookies to cool while baking the rest. Be sure to reline the pans. Although the baked cookies may appear to be stuck to the foil, once they have cooled sufficiently, they can be gently peeled right off. Makes 50 cookies. Wow! Talk about an easy recipe. They look delish. I noticed the bottle of milk right off as well as the china cups and saucers. Your family was really classy. I love that fun photo~ you can just feel the closeness. The cookies look great too! Lisa: That's the beauty of Italian food. There's always something you haven't tried. Sandi: Makes me want to have known them when they were young. Sally: They are easy. Really moist and chewy, too. This recipe's a gem. My Mom was all Italian and she was a great cook. She taught me to cook when I was nine years old. She also taught me how to sew and embroider when was even younger. That was her legacy to me. I am so greatfull for all she taught me. I use everything she ever taught me every day. She used to make annisett biscotti and on Easter egg basket cookies. They were yummy. I love to bake and make cookies for a small restaurant and other shops are interested in my baked goods. I enjoy baking and cooking very much. I love the scents of the spices and flavors I use for the cookies. I use several of my Mom's recipes and it feels like home to me. I miss my Mom as she has passed on but when I am baking she is right there with me. Thanks for sharing your family's recipes. The girls have the same type of hair dos as my Mom did when she was young.